Mulranny retained the Gráinne Uaile Cup on Saturday last at Carne , as they saw their lead on the Home side of 16 points reduced by just four on the day. Winners on a very blustery day were Eamon Mongan and Patrick Gallagher of Mulranny with a phenomenal score of 40 points. Runners up were the Belmullet pairing of John Hanley and Vincent Keane. 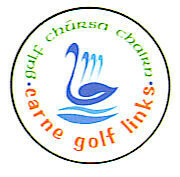 The third leg of the Gráinne Uaile which was due to tee off from 0930 next Sunday in Carne has been postponed due to a bereavement in Mulranny. 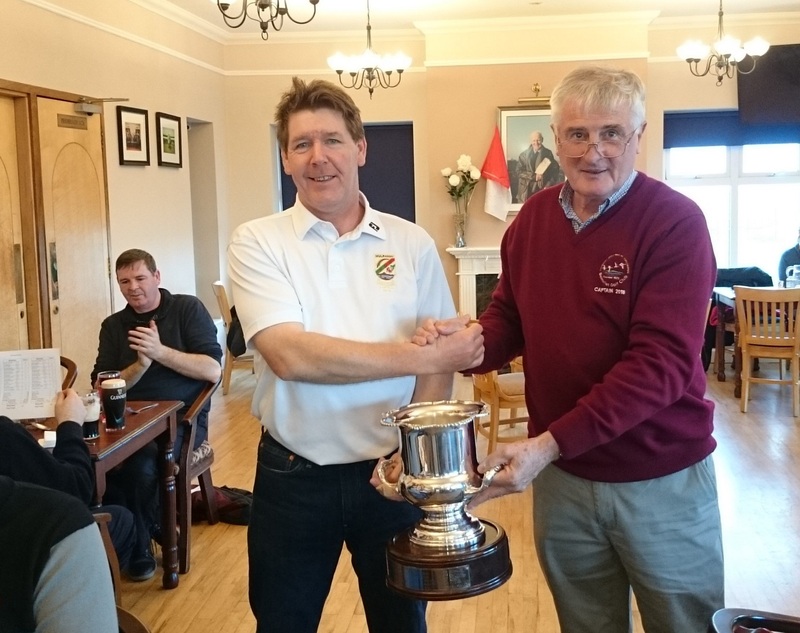 The untimely death of Tom Molloy, Past Captain of Mulranny 1998 and a regular Grainne Uaile competitor has come as very sad news not just for Mulranny Golf Club but for both Achill and Belmullet Golf Clubs too. Tom , a fine musician and a great Republic of Ireland soccer fan is a brother in law of Vincent Fahy. 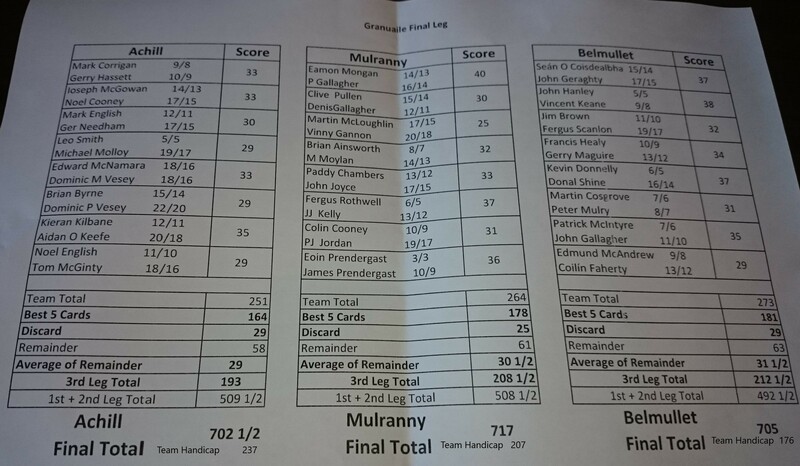 Following yesterday's play in Mulranny ,Achill lead the way by 1 point ahead of Mulranny with Belmullet a further 16 points behind. This leaves us with a deficit of 2.8 points per card to 'pull back' next week, a difficult but possible task. Congratulations go to Mulranny on winning their first ever pennant on Saturday when they overcame Ballinasloe in the final of the Jack O Sullivan trophy. Good luck also to Achill on Monday next when they play Castle Dargan in the semi final of the Connacht Shield. 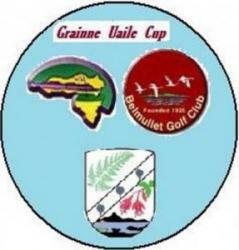 The first leg of the Grainne Uaile was played in breezy but mainly dry conditions in Achill yesterday. The scoring in the conditions was good with our best performers on the day Martin Cosgrove and Chris Breen with a great score of 42 points. In the team event we didn't lose too much ground on Mulranny and Achill and provided we can stay within 15 or 16 points (albeit a tough ask) of both after the second leg in Mulranny next week,we're in with a fighting chance on our home patch in two week's time. The first leg of the Gráinne Uaile tees off next Sunday in Keel ,Achill Island with 8 fourball betterball pairings representing each of the three Clubs. Mulranny are defending the trophy in 2018 and host the second leg on Sunday week while we host the third and final leg in Carne on Sunday September 23rd. For those not involved in the first leg there is an 18 Hole Stableford competition in Carne on Sunday off the White tees. A fee of €10 per person per day will apply.